A number of resident, weekend resident and camping families whose members sailed off the beach at Rye decided to organise and run a yacht race on New Year’s Day, 1970. The race objectives were to blow away the dregs of an over-indulgent New Year’s Eve celebration and to provide some fun for families and friends. Six boats eventually started in an exciting, carnival atmosphere. The race concluded with the winner receiving a magnificent trophy laboriously crafted from assorted emply cans carefully covered with aluminium foil and garlanded with toilet paper bunting. All participants received a memento of the occasion and the bookmaker made a killing! The event was so successful that it was repeated in 1971 and attracted thirteen starters. A meeting of interested families was convened during the Australia Day weekend in 1971. At this meeting, it was resolved to conduct a race every Sunday through to Labour Day in March. 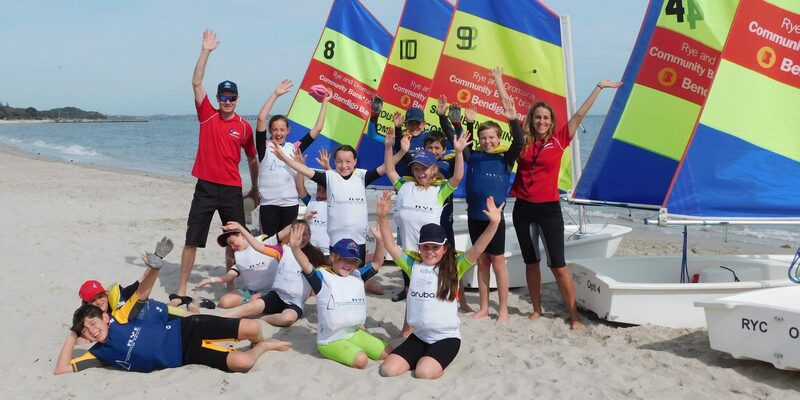 This program proved to be very popular, and led to a further meeting on Sunday, 30 May 1971, at which Rye Yacht Club was officially formed by some twenty-five families. A constitution was prepared and adopted on 2 July 1972. The Club became a member of the Victorian Yachting Council (now Yachting Victoria) in October 1972. Originally, the club operated on the beach opposite Ozone Street, but in 1974, moved to a foreshore enclosure opposite Lyons Street. In 1982, the Club moved to the present site, an enclosure of 60 metres by 20 metres. The Clubhouse was built with funds raised by members over the previous years, and officially opened on 31 March 1985. The Club canteen was registered with the Health Department of Victoria in 1992. In 2004, the western upper deck area became an enclosed room adjacent to the existing committee room, creating a large room suitable for training and recreational purposes. In 2015, the Club enclosed the area below the extension to create a dedicated Sailing School room, where all the school equipment and boats can be stored. In 2016, the Mornington Peninsula Shire Council approved an extension to the yard to the south. The area was cleared and a new attractive timber fence constructed in 2017.